As a second generation family business where our employees are held in the same high regard as family, the safety of all employees is a top priority at Morrow-Meadows Corporation. Our behavior-based safety culture holds every employee from apprentice to Sr. level manager accountable for safety, both personally and collectively. Safety training classes are conducted in-house by qualified trainers. In house training allows targeted training based on leading and lagging indicators that come directly from the real life experiences from our jobsites. Near misses are reported the same as accidents allowing us to focus our training to risk areas and behaviors. All field managers receive regular refresher classes keeping their California and Federal OSHA Certifications current. Included are classes on Fall Protection, Excavation Safety, Confined Space, Hazard Communication, Mobile and Aerial Lift operation and safety to name just a few. Our safety record and performance has been unmatched in the industry as indicated by our OSHA incident rates, numerous national and local safety awards and our experience modifier. 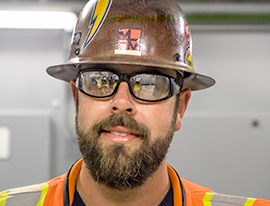 The company’s value-based safety record, practices and reputation work together to create an environment benefiting both employees and customers. Morrow Meadows Corporation consistently has low Recordable Incident Rates (RIR). Compared to a nation average of 3.7 (2013) for electrical contractors, our incident rate tends to be 9-12 times lower. Morrow Meadows Corporation consistently has a low Experience Modifier ranging from 0.44 to 0.67. These overall loss numbers are a reflection of an enforced and effective safety program. We have one of the industry’s lowest Lost Time Incident Rate. We have one of the best safety records, based on the number of man-hours worked (well over 2 million man-hours a year).